Description: This article demonstrates five steps to inject your code in a portable executable (EXE, DLL, OCX,...) file without recompiling source code. PE Maker - Step 1 - Add new Section. PE Maker - Step 2 - Travel towards OEP. PE Maker - Step 3 - Support Import Table. PE Maker - Step 4 - Support DLL and OCX. PE Maker - Step 5 - Final work. 3.1.3 Which parts are important in a debugger interface? It might be, you demand to comprehend the ways a virus program injects its procedure in to the interior of a portable executable file and corrupts it, or you are interested in implementing a packer or a protector for your specific intention to encrypt the data of your portable executable (PE) file. This article is committed to represent a brief intuition to realize the performance which is accomplished by EXE tools or some kind of mal-wares. You can employ the source code of this article to create your custom EXE builder. It could be used to make an EXE protector in the right way, or with a wrong intention, to pullulate a virus. However, my purpose of writing this article has been to gaze on the first application, so I will not be responsible for the immoral usage of these methods. There are no specific mandatory prerequisites to follow the topics in this article. If you are familiar with debugger and also the portable file format, I suggest you to drop the sections 2 and 3, the whole of these sections have been made for people who don’t have any knowledge regarding the EXE file format and also debuggers. The Portable Executable file format was defined to provide the best way for the Windows Operating System to execute code and also to store the essential data which is needed to run a program, for example constant data, variable data, import library links, and resource data. It consists of MS-DOS file information, Windows NT file information, Section Headers, and Section images, Table 1. These data let you remember the first days of developing the Windows Operating System, the days. We were at the beginning of a way to achieve a complete Operating System like Windows NT 3.51 (I mean, Win3.1, Win95, Win98 were not perfect OSs). The MS-DOS data causes that your executable file has the performance inside MS-DOS and the MS-DOS Stub programlets it display: "This program can not be run in MS-DOS mode" or "This program can be run only in Windows mode", or some things like these comments when you try to run a Windows EXE file inside MS-DOS 6.0, where there is no footstep of Windows. Thus, this data is reserved for the code to indicate these comments in the MS-DOS operating system. The most interesting part of the MS-DOS data is "MZ"! Can you believe, it refers to the name of "Mark Zbikowski", one of the first Microsoft programmers? To me, only the offset of the PE signature in the MS-DOS data is important, so I can use it to find the position of the Windows NT data. I just recommend you to take a look at Table 1, then observe the structure of IMAGE_DOS_HEADER in the <winnt.h> header in the <Microsoft Visual Studio .net path>\VC7\PlatformSDK\include\ folder or the <Microsoft Visual Studio 6.0 path>\VC98\include\ folder. I do not know why the Microsoft team has forgotten to provide some comment about this structure in the MSDN library! WORD   e_magic;                // Magic number "MZ"
This sample is useful for the whole of this article. 0001BF00  63 00 2E 00 63 00 68 00  c...c.h. 0001BF08  6D 00 0A 00 43 00 61 00  m...C.a. 0001BF10  6C 00 63 00 75 00 6C 00  l.c.u.l. 0001BF18  61 00 74 00 6F 00 72 00  a.t.o.r. 0001BF20  11 00 4E 00 6F 00 74 00  ..N.o.t. 0001BF28  20 00 45 00 6E 00 6F 00   .E.n.o. 0001BF30  75 00 67 00 68 00 20 00  u.g.h. .
0001BF38  4D 00 65 00 6D 00 6F 00  M.e.m.o. It seems to be very simple, the retrieval of the headers information. I recommend inspecting the MSDN library regarding the IMAGE_NT_HEADERS structure definition. It makes comprehensible to grasp what the image NT header maintains to execute a code inside the Windows NT OS. Now, you are conversant with the Windows NT structure, it consists of the "PE" Signature, the File Header, and the Optional Header. Do not forget to take a glimpse at their comments in the MSDN Library and besides in Table 1. You can observe clearly, the main purpose of these values, and their role when the internal virtual memory space allocated for an EXE file by the Windows task manager if you pay attention to their explanations in MSDN library, so I am not going to repeat the MSDN annotations here. The last one (15) was reserved for use in future; I have not yet seen any purpose to use it even in PE64. To comprehend more regarding the significance of data directories, I forward you to section 3.4.3, Microsoft Portable Executable and the Common Object File Format Specification document by Microsoft, and furthermore section 6 of this document, where you discern the various types of sections and their applications. We will discuss the section's advantage subsequently. We currently observe how the portable executable files declare the location and the size of a section on a disk storage file and inside the virtual memory space allocated for the program with IMAGE_NT_HEADERS-> OptionalHeader->SizeOfImage by the Windows task manager, as well the characteristics to demonstrate the type of the section. To understand better the Section header as my previous declaration, I suggest having a short gape on the IMAGE_SECTION_HEADER structure definition in the MSDN library. For an EXE packer developer, VirtualSize, VirtualAddress, SizeOfRawData, PointerToRawData, and Characteristics cells have significant rules. While developing an EXE packer, you should be clever enough to play with them. There are somethings to be noted while you modify them; you should take care to align the VirtualSize and VirtualAddress according to OptionalHeader->SectionAlignment, as well as SizeOfRawData and PointerToRawData in line with OptionalHeader->FileAlignment. Otherwise, you will corrupt your target EXE file and it will never run. RegardingCharacteristics, I pay attention mostly to establish a section by IMAGE_SCN_MEM_READ | IMAGE_SCN_MEM_WRITE | IMAGE_SCN_CNT_INITIALIZED_DATA, I prefer my new section has ability to initialize such data during running process; such as import table; besides, I need it to be able to modify itself by the loader with my settings in the section characteristics to read- and writeable. Moreover, you should pay attention to the section names, you can know the purpose of each section by its name. I will just forward you to section 6: Microsoft Portable Executable and the Common Object File Format Specification documents. I believe, it represents the totality of sections by their names, Table 2. To comprehend the section headers and also the sections, you can run the sample PE viewer. By this PE viewer, you only can realize the application of the section headers in a file image, so to observe the main significance in the Virtual Memory, you should try to load a PE file by a debugger, and the next section represents the main idea of using the virtual address and –size in the virtual memory by using a debugger. The last note is about IMAGE_NT_HEADERS-> FileHeader->NumberOfSections, that provides a number of sections in a PE file, do not forget to adjust it whenever you remove or add some sections to a PE file, I am talking about section injection! In this part, you will become familiar with the necessary and essential equipments to develop your PE tools. The first essential prerequisite, to become a PE tools developer, is to have enough experience with bug tracer tools. Furthermore, you should know most of the assembly instructions. To me, the Intel documents are the best references. You can obtain them from the Intel site for IA-32, and on top of that IA-64; the future belongs to IA-64 CPUs, Windows XP 64-bit, and also PE64! IA-32 Intel Architecture Software Developer’s Manuals. Intel Itanium Architecture Assembly Language Reference Guide. The Intel Itanium Processor Developer Resource Guide. To trace a PE file, SoftICE by Compuware Corporation, I knew it also as named NuMega when I was at high school, is the best debugger in the world. It implements process tracing by using kernel mode method debugging without applying Windows debugging application programming interface (API) functions. In addition, I am going to introduce one perfect debugger inuser mode level. It utilizes the Windows debugging API to trace a PE file and also attaches itself to an active process. These API functions have been provided by Microsoft teams, inside the Windows Kernel32 library, to trace a specific process, by using Microsoft tools, or perhaps, to make your own debugger! Some of those API functions inlude: CreateThread(),CreateProcess(), OpenProcess(), DebugActiveProcess(), GetThreadContext(), SetThreadContext(), ContinueDebugEvent(), DebugBreak(), ReadProcessMemory(), WriteProcessMemory(), SuspendThread(), and ResumeThread(). It was in 1987; Frank Grossman and Jim Moskun decided to establish a company called NuMega Technologies in Nashua, NH, in order to develop some equipments to trace and test the reliability of Microsoft Windows software programs. Now, it is a part of Compuware Corporation and its product has participated to accelerate the reliability in Windows software, and additionally in Windows driver developments. Currently, everyone knows the Compuware DriverStudio which is used to establish an environment for implementing the elaboration of a kernel driver or a system file by aiding the Windows Driver Development Kit (DDK). It bypasses the involvement of DDK to implement a portable executable file of kernel level for a Windows system software developer. For us, only one instrument of DriverStudio is important, SoftICE, this debugger can be used to trace every portable executable file, a PE file for user mode level or a PE file for kernel mode level. 0023:01013020 20 00 00 00 00 00 00 00-53 63 69 43 61 6C 63 00 ........SciCalc. 0010:0007FFC4 4F 6D 81 7C 38 07 91 7C-FF FF FF FF 00 90 FD 7F Om |8 ‘| . 0010:0007FFD4 ED A6 54 80 C8 FF 07 00-E8 B4 F5 81 FF FF FF FF T .
It was about 4 years ago, that I first saw this debugger by chance. For me, it was the best choice, I was not so wealthy to purchase SoftICE, and at that time, SoftICE only had good functions for DOS, Windows 98, and Windows 2000. I found that this debugger supported all kinds of Windows versions. Therefore, I started to learn it very fast, and now it is my favorite debugger for the Windows OS. It is a debugger that can be used to trace all kinds of portable executable files except a Common Language Infrastructure (CLI) file format in user mode level, by using the Windows debugging API. Oleh Yuschuk, the author, is one of worthiest software developers I have seen in my life. He is a Ukrainian who now lives in Germany. I should mention here that his debugger is the best choice for hacker and cracker parties around the world! It is a freeware! You can try it from OllyDbg Homepage. I have introduced two debuggers without talking about how you can employ them, and also which parts you should pay attention more. Regarding using debuggers, I refer you to their instructions in help documents. However, I want to explain shortly the important parts of a debugger; of course, I am talking about low-level debuggers, or in other words, machine-language debuggers of the x86 CPU families. Command line, command buttons, or shortcut keys to follow the debugging process. You can compare Figure 1 and Figure 2 to distinguish the difference between SoftICE and OllyDbg. When you want to trace a PE file, you should mostly consider these five subdivisions. Furthermore, every debugger comprises of some other useful parts; you should discover them by yourself. We can consider OllyDbg and SoftICE as excellent disassemblers, but I also want to introduce another disassembler tool which is famous in the reverse engineering world. Proview or PVDasm is an admirable disassembler by the Reverse-Engineering-Community; it is still under development and bug fixing. You can find its disassmbler source engine and employ it to create your own disassembler. W32DASM can disassemble both 16 and 32 bit executable file formats. In addition to its disassembling ability, you can employ it to analyze import, export and resource data directories data. 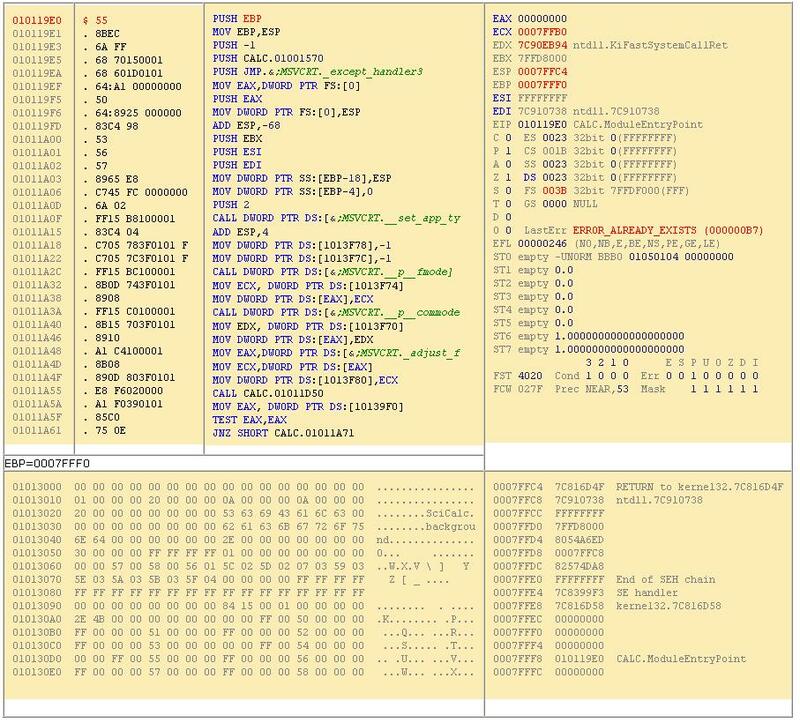 All reverse-engineering experts know that IDA Pro can be used to investigate, not only x86 instructions, but that of various kinds of CPU types like AVR, PIC, and etc. It can illustrate the assembly source of a portable executable file by using colored graphics and tables, and is very useful for any newbie in this area. Furthermore, it has the capability to trace an executable file inside the user mode level in the same way as OllyDbg. A good PE tools developer is conversant with the tools which save his time, so I recommend to select some appropriate instruments to investigate the base information under a portable executable file. LordPE by y0da is still the first choice to retrieve PE file information with the possibility to modify them. PE iDentifier is valuable to identify the type of compilers, packers, and cryptors of PE files. As of now, it can detect more than 500 different signature types of PE files. Resource Hacker can be employed to modify resource directory information; icon, menu, version info, string table, and etc. WinHex, it is clear what you can do with this tool. Eventually, CFF Explorer by Ntoskrnl is what you wish to have as a PE Utility tool in your dream; it supports PE32/64, PE rebuild included Common Language Infrastructure (CLI) file, in other words, the .NET file, a resource modifier, and much more facilities which can not be found in others, just try and discover every unimaginable option by hand. We are ready to do the first step of making our project. So I have provided a library to add a new section and rebuild the portable executable file. Before starting, I like you get familiar with the headers of a PE file, by using OllyDbg. You should first open a PE file, that pops up a menu, View->Executable file, again get a popup menu Special->PE header. And you will observe a scene similar to Figure 3. Now, come to Main Menu View->Memory, try to distinguish the sections inside the Memory map window. I want to explain how we can plainly change the Offset of Entry Point (OEP) in our sample file, CALC.EXE of Windows XP. First, by using a PE Tool, and also using our PE Viewer, we find OEP, 0x00012475, and Image Base, 0x01000000. This value of OEP is the Relative Virtual Address, so the Image Base value is used to convert it to the Virtual Address. DynLoader(), in loader.cpp, is reserved for the data of the new section, in other words, the Loader. Unfortunately, this source can only be applied for the sample test file. We should complete it by saving the value of the original OEP in the new section, and use it to reach the real OEP. I have accomplished it in Step 2 (Section 5). I have made a simple class library to recover PE information and to use it in a new PE file. By Table 1, the usage of image_dos_header, pDosStub, image_nt_headers, image_section_header [MAX_SECTION_NUM], and image_section[MAX_SECTION_NUM] is clear. We use OpenFile() and SaveFile() to retrieve and rebuild a PE file. Furthermore, AddNewSection() is employed to create the new section, the important step. In pecrypt.cpp, I have represented another class, CPECryptor, to comprise the data of the new section. Nevertheless, the data of the new section is created by DynLoader() in loader.cpp, DynLoader Step 1. We use the CPECryptor class to enter this data in to the new section, and also some other stuff. Set Linker->General->Enable Incremental Linking to No (/INCREMENTAL:NO). Right now, we save the Original OEP and also the Image Base in order to reach to the virtual address of OEP. I have reserved a free space at the end of DynLoader() to store them, DynLoader Step 2. The new function, CPECryptor::CopyData1(), will implement the copy of the Image Base value and the Offset of Entry Point value into 8 bytes of free space in the loader. It is important to recover the Original Context of the thread. We have not yet done it in the DynLoader Step 2 source code. We can modify the source of DynLoader() to repossess the first Context. We can also recover the original stack by setting the value of the beginning stack + 0x34 to the Original OEP, but it is not very important. Nevertheless, in the following code, I have accomplished the loader code by a simple trick to reach OEP in addition to redecorating the stack. You can observe the implementation by tracing using OllyDbg or SoftICE. An exception is generated when a program falls into a fault code execution and an error happens, so in such a special condition, the program immediately jumps to a function called the exception handler from exception handler list of the Thread Information Block. The next example of a try-except statement in C++ clarifies the operation of structured exception handling. Besides the assembly code of this code, it elucidates the structured exception handler installation, the raise of an exception, and the exception handler function. 00401032: PUSH OFFSET "1: Raise an Exception"
0040104D: PUSH OFFSET "2: In Finally"
0040105D: PUSH OFFSET "3: In Filter"
00401073: PUSH OFFSET "4: In Exception Handler"
This program runs the exception expression, printf("3: In Filter\n");, when an exception happens, in this example the INT 3 exception. You can employ other kinds of exception too. In OllyDbg, Debugging options->Exceptions, you can see a short list of different types of exceptions. So we yearn for making the ensuing C++ code in assembly language to inaugurate our engine to approach the Offset of Entry Point by SEH. The exception value, __except(..., Value), determines how the exception is handled, it can have three values, 1, 0, -1. To understand them, refer to the try-except statement description in the MSDN library. We set it to EXCEPTION_CONTINUE_SEARCH (0), not to run the exception handler function, therefore by this value, the exception is not recognized, is simply ignored, and the thread continues its code-execution. As you perceived from the illustrated code, the SEH installation is done by the FS segment register. Microsoft Windows 32 bit uses the FS segment register as a pointer to the data block of the main thread. The first 0x1C bytes comprise the information of the Thread Information Block (TIB). Therefore, FS:[00h] refers to ExceptionList of the main thread, Table 3. In our code, we have pushed the pointer to _except_handler1_OEP_Jump in the stack and changed the value of ExceptionList, FS:[00h], to the beginning of the stack, ESP. In this part, we effectuate our performance by accomplishing the OEP approach. We change the Context of the thread and ignore every simple exception handling, and let the thread continue the execution, but in the original OEP! When an exception happens, the context of the processor during the time of the exception is saved in the stack. By EXCEPTION_POINTERS, we have access to the pointer of ContextRecord. The ContextRecord has the CONTEXT data structure, Table 4, this is the thread context during the exception time. When we ignore the exception by EXCEPTION_CONTINUE_SEARCH (0), the instruction pointer as well the context will be set to ContextRecord in order to return to the previous condition. Therefore, if we change the Eip of the Win32 Thread Context to the Original Offset of Entry Point, it will come clearly into OEP. When you make a Windows application project, the linker includes at least kernel32.dll in the base dependencies of your project. Without LoadLibrary() and GetProcAddress() of Kernel32.dll, we can not load a DLL in run-time. The dependencies information is stored in the import table section. By Dependency Walker, it is not so difficult to observe the DLL module and the functions which are imported into a PE file. We attempt to establish our custom import table to conduct our project. Furthermore, we have to fix up the original import table at the end in order to run the real code of the program. I strongly advise you to read the section 6.4 of the Microsoft Portable Executable and the Common Object File Format Specification document. This section contains the principal information to comprehend the import table performance. The VirtualAddress refers to structures by IMAGE_IMPORT_DESCRIPTOR. This structure contains the pointer to the imported DLL name and the relative virtual address of the first thunk. When a program is running, the Windows task manager sets the thunks by the virtual address of the function. The virtual address is found by the name of the function. At first, the thunks hold the relative virtual address of the function name, Table 5; during execution, they are fixed up by the virtual address of the functions, Table 6. I have prepared a class library to make every import table by using a client string table. The CITMaker class library in itmaker.h, it will build an import table by sz_IT_EXE_strings and also the relative virtual address of the import table. We subsequently employ this class library to establish an import table to support DLLs and OCXs, so this is a general library to present all possible import tables easily. The next step is clarified in the following code. It makes it easy to expand the other part of our project by this performance, so we construct two data tables: first for API virtual addresses, and the second for the JMP [XXXXXXXX]. In order to run the program again, we should fix up the thunks of the actual import table, otherwise we have a corrupted target PE file. Our code must correct all of the thunks the same as Table 5 to Table 6. Once more, LoadLibrary() and GetProcAddress() aid us in our effort to reach our intention. Now, we intend to include the dynamic link library (DLL) and OLE-ActiveX Control in our PE builder project. Supporting them is very easy if we pay attention to the two time arrival into the Offset of Entry Point, the relocation table implementation, and the client import table. When a DLL is loaded by LoadLibrary(), or an OCX is registered by using LoadLibrary() and GetProcAddress() through calling DllRegisterServer(), the first of the OEP arrival is done. When the main program frees the library usage by FreeLibrary(), the second OEP arrival happens. To perform this, I have employed a trick, that causes in the second time again, the instruction pointer (EIP) traveling towards the original OEP by the structured exception handler. I hope you have caught the trick in the preceding code, but this is not all of it, we have problem in ImageBase, when the library has been loaded in different image bases by the main program. We should write some code to find the real image base and store it to use forward. This code finds the real image base by investigating the stack information. By using the real image base and the formal image base, we should correct all memory calls inside the image program!! Don't be afraid, it will be done simply by the relocating the table information. To understand the relocation table better, you can take a look at the section 6.6 of Microsoft Portable Executable and Common Object File Format Specification document. The relocation table contains many packages to relocate the information related to the virtual address inside the virtual memory image. Each package comprise of a 8 bytes header to exhibit the base virtual address and the number of data, demonstrated by the IMAGE_BASE_RELOCATION data structure. By OllyDbg, we have the same as the following for the ".reloc" section, by using the Long Hex viewer mode. In this example, the base virtual address is 0x1000 and the size of the block is 0x184. Each package performs the relocation by using consecutive 4 bytes form its internal information. The first byte refers to the type of relocation and the next three bytes are the offset which must be used with the base virtual address and the image base to correct the image information. IMAGE_REL_BASED_HIGH (1): relocate by the high 16 bytes of the base virtual address and the offset. IMAGE_REL_BASED_LOW (2): relocate by the low 16 bytes of the base virtual address and the offset. IMAGE_REL_BASED_HIGHLOW (3): relocate by the base virtual address and the offset. What is done in the relocation? By relocation, some values inside the virtual memory are corrected according to the current image base by the ".reloc" section packages. I have employed the following code from Morphine packer to implement the relocation. In order to support the OLE-ActiveX Control registration, we should present an appropriate import table to our target OCX and DLL file. By using Thread Local Storage (TLS), a program is able to execute a multithreaded process, this performance mostly is used by Borland linkers: Delphi and C++ Builder. When you pack a PE file, you should take care to keep clean the TLS, otherwise, your packer will not support Borland Delphi and C++ Builder linked EXE files. To comprehend TLS, I refer you to section 6.7 of the Microsoft Portable Executable and Common Object File Format Specification document, you can observe the TLS structure by IMAGE_TLS_DIRECTORY32 in winnt.h. We are ready to place our code inside the new section. Our code is a "Hello World!" message by MessageBox() from user32.dll. By this article, you have perceived how easily we can inject code to a portable executable file. You can complete the code by using the source of other packers, create a packer in the same way as Yoda's Protector, and make your packer undetectable by mixing up with Morphine source code. I hope that you have enjoyed this brief discussion of one part of the reverse engineering field. See you again in the next discussion!